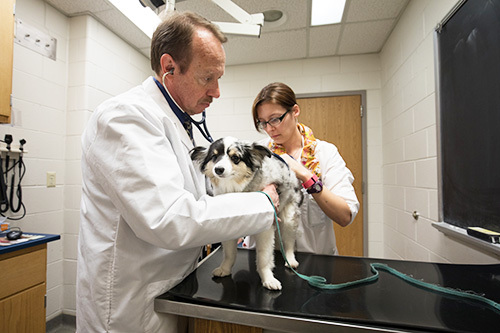 Dr. Larry Adams, PVM professor of small animal internal medicine, and Rachel Wirgau, a clinical year DVM student from Ross University, examine Addie, a miniature Australian Shepherd dog. 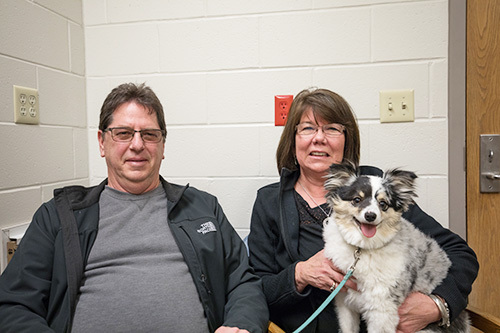 Anne and Brian Tidler of Clayton, Ind., were nearing their wits' end when they turned to Purdue Veterinary Medicine's Veterinary Teaching Hospital for help with a challenging problem afflicting their miniature Australian Shepherd dog, named Addie. At nearly two years of age, Addie was adorable and had a great personality, but she was incontinent and had to be in diapers constantly. Working with their regular veterinarians, the Tidler's had tried medicine to treat the condition and that approach worked for a while, but over time, the medicine became less effective. As they sought answers, a friend of the family, Dr. Jack Chaille (PU DVM 2014) of the Franklin Animal Clinic in Franklin, Ind., referred them to PVM Professor of Small Animal Internal Medicine Larry Adams. On March 6, the Tidler's brought Addie to the Small Animal Hospital (SAH). The only abnormality noted on physical exam was incontinence and a urinalysis revealed a urinary tract infection (UTI). Dr. Adams, a board certified small animal internal medicine specialist who focuses on urology, recommended a cystoscopy to look at Addie's urethra and bladder. Dr. Adams performed the cystoscopy the next day. Using a cystoscope, a thin lighted tube with a camera attached, Dr. Adams confirmed that Addie had bilateral ectopic ureters, which create a tunnel like effect where the ureteral openings tunnel into the urethra, causing urine to leak continuously instead of being stored in the bladder. This condition also makes the dog more susceptible to UTIs. Cystoscopic guided laser ablation of ectopic ureters is a specialized procedure commonly performed in the SAH. The procedure is used to correct an ectopic ureter, a congenital condition in which the ureter carrying urine from the kidneys opens in an abnormal location instead of in the bladder. Dr. Adams passed a guide wire through one of the abnormal openings. Over the guide wire, a ureteral catheter was placed which remained there throughout the treatment. With the catheter in position, Dr. Adams passed a laser fiber through the working channel of the cystoscope and used the laser to cut, or ablate, the excess tissue of the wall of the ectopic ureter. With the free wall of the ectopic ureter gone and the ureteral opening located within the bladder, urine could be stored in the bladder instead of continuously leaking from the urethra. Dr. Adams then performed the laser ablation on the other ureter, and also used the laser to correct another abnormality, called a vaginal septa, which can also contribute to UTIs. Addie recovered very quickly, and was sent home the following day on antibiotics for her UTI. According to Anne and Brian, Addie is doing fantastic and is no longer incontinent. She does not need to wear a diaper daily, and can go on living her carefree and happy life. 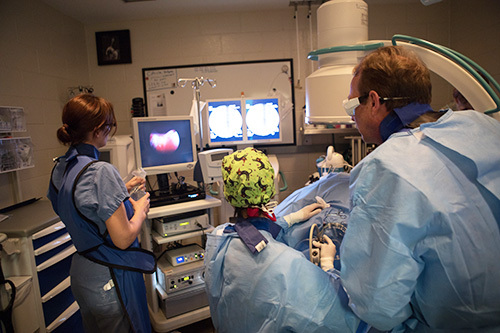 Dr. Larry Adams and Dr. Mays Malkawi, a 2nd year resident in Small Animal Internal Medicine, perform cystoscopic-guided laser ablation to correct bilateral ectopic ureters that were causing Addie's incontinence. Addie and her owners, Anne and Brian Tidler of Clayton, Ind., can now look forward to a more normal life with their beloved companion, Addie.